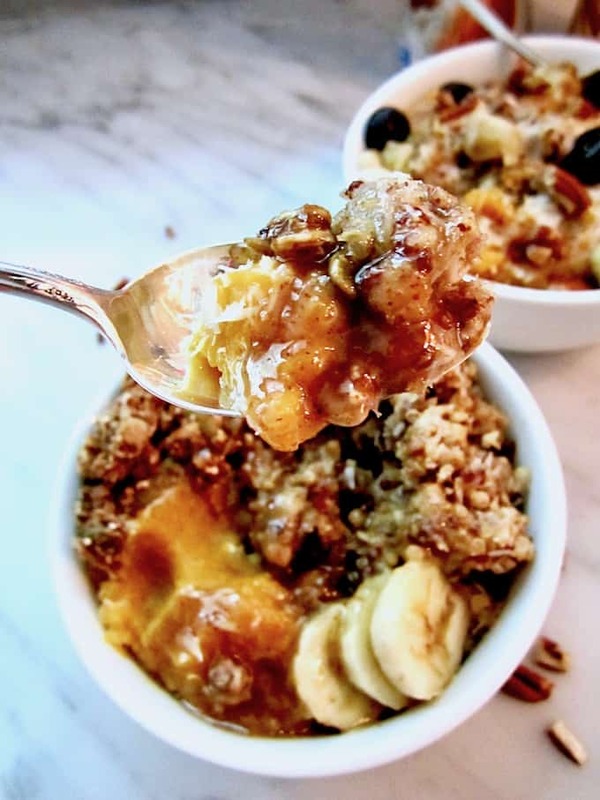 This easy Slow Cooker Pumpkin Quinoa Breakfast Bowl is a warming, protein filled, gluten free meal perfect for busy schedules, topped with the most delicious 3 ingredient vegan caramel sauce (refined sugar free)! Thank you for supporting the brands that make Vegan Chickpea possible! Now that we’re approaching my favorite season, fall, it’s time to break out that oh-so-special, seasonal ingredient that’s one of my favs (and I secretly eat it all year long!) – PUMPKIN! Oh, glorious pumpkin. You can be sweet or savory, roasted like a root vegetable, pureed into pies, mashed like potatoes, mixed into smoothies or blended into lattes. If you haven’t already, I recommend you check out my Pumpkin Cranberry Crumb Mini Muffins and Pumpkin Chocolate Chip Muffin Top Cookies + Coconut Frosting! In today’s recipe, pumpkin is mixed with fluffy, nutty quinoa for both a sweet and savory, high protein breakfast. I’m also celebrating that I can east quinoa again! For whatever reason, quinoa used to give me a bellyache, which totally sucked because a) it’s gluten free, b) it’s vegan, and c) it’s completely delicious, healthy, high protein and so common everywhere now! I had been avoiding it for a few years but recently had the inspiration to try eating it again, and I had no issues whatsoever! *Fist pump! * So now I get to share some quinoa recipes with you – woo hoo! A couple things I did that may have helped me digest it easier that you can try too if you have digestive challenges is: 1) I rinsed the grain under cold water before cooking – sometimes a residue gets left on quinoa, but it rinses off, so take the extra minute to do this! 2) I bought organic. 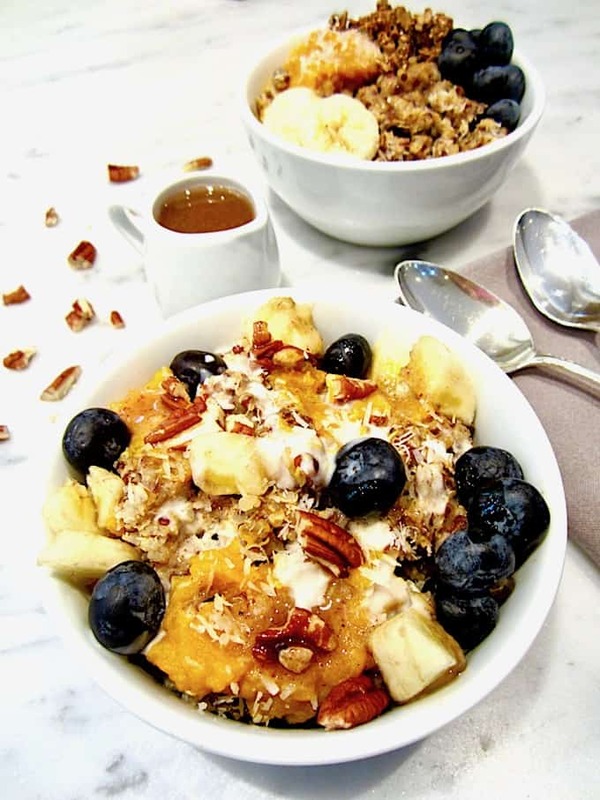 It’s a healthy, high protein breakfast bowl that can be customized to be more or less sweet, depending on your preference – the whole family will enjoy this! I can’t believe that it’s already back-to-school season in some parts of the country – uhmm what?! When did that happen?!?! While I’m not going back to school myself anymore (though part of me would love to enjoy a semester of college again! ), this is a super busy time for me and I feel like I’m trying to balance a lot – moving countries, getting a car (I bought a car I LOVE on Tuesday – so freakin’ excited! ), working almost full time while putting as much time into Vegan Chickpea as possible, and more – so I’m fitting right in with the frenzied parents who are trying to get into healthy, manageable routines again. One way I stay prepared is to make sure that I always have my go-to ingredients in my pantry, so if I don’t have time to run to the store to get fresh groceries, at least I know I have some backups I can depend on. One thing I always have on hand are shelf-stable non dairy milks since they require no refrigeration until after opening. 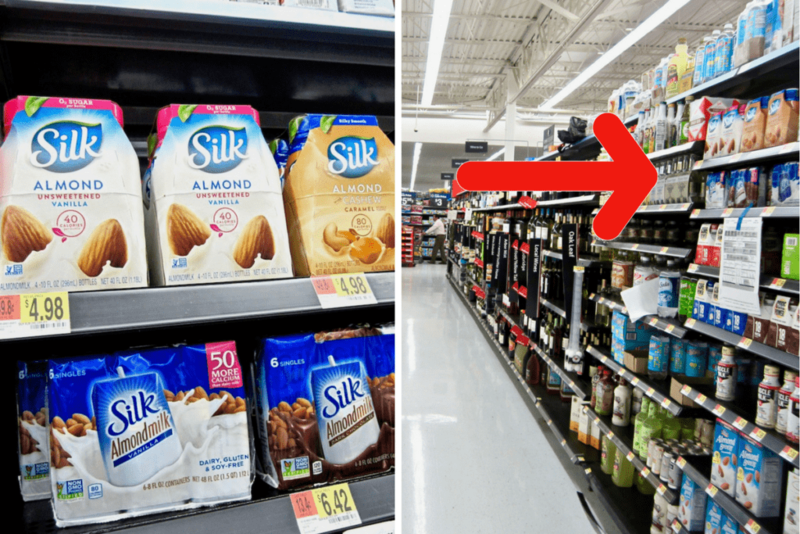 At a recent trip to Walmart I recently discovered Silk’s new Shelf-Stable, Single Serve 4-pack bottles of Unsweetened Vanilla Almondmilk (my fav! ), and an Almondmilk and Cashewmilk with Caramel blend flavor. I was picking them off the shelf at the same time as a cute young couple who seemed to be having a date night out shopping without their kids (things to look forward to about parenthood, huh?!). The woman was so happy to have found Silk’s single serve bottles, because her son has a dairy allergy and now she has some new, convenient options for what she can pack in his lunch. Yay! So, I found these Silk bottles after looking around for awhile, because they were in the aisle across from the beer and next to the wine. Kinda random, eh? I actually had to ask one of the very nice stock guys to point me in the direction, since I could only find the refrigerated milks. Here’s a photo of them in the store so you know what to look for! These Silk milks are both excellent sources of calcium, while being dairy and gluten free. They have no saturated fat, are 100% cholesterol free, have no artificial colors/flavors, and are verified by the Non-GMO Project’s product verification program. I especially like the Unsweetened Vanilla Almondmilk because I mostly avoid sugar, and that line has no sweeteners added to it with zero grams of sugar. But, either flavor will work perfectly in this recipe – it just depends on your preference. As a side note, can I just say that – as an American returning to the States after living in Europe – I really appreciate certain conveniences we have here that just aren’t an option in other parts of the world, like getting to grocery shop at 10pm. That may sound really weird, especially to non-Americans, but if I’ve been busy all day and want to avoid the hectic crowds, shopping late night totally rocks. Thank you 24/7 Walmart in Fairfax! Slow Cookers are a super easy, no fuss, convenient kitchen appliance for busy times. Just throw everything in, press a button, wait a few hours, and you have a meal! It’s especially great for making a big batch of anything – in this case you can double or triple the recipe to have leftovers (I’m a big proponent of leftovers! ), or to have enough to feed your whole family. One of my favorite recipes to feed a crowd is my Vegan + Gluten Free Slow Cooker Lasagna. Is the slow cooker really necessary for this recipe? No, not really. You can do this in a rice cooker, or on the stove (see recipe notes for details) – I sometimes just enjoy taking more of the ‘set it and forget it’ approach that the slow cooker offers, especially when I have super busy days. Plus, I don’t usually eat breakfast for a couple hours after rising anyway, so I can throw this on when I wake up and then – presto! – breakfast is ready when I am. I cooked this on high for about 2.5 hours. I have not tested it overnight, but my best guess would be to cook on low for 4 – 6 hours. 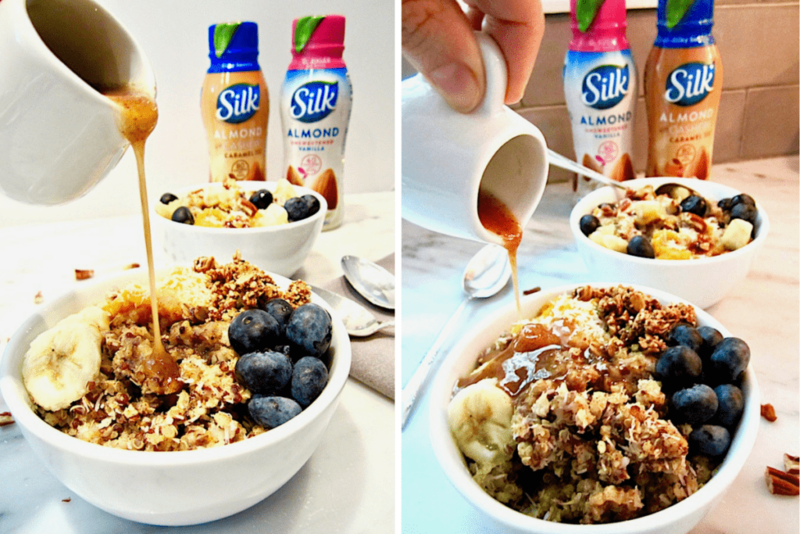 You won’t even believe how gosh darn delicious this vegan caramel sauce is. I never thought that the combination of coconut oil + maple syrup + almond butter (+ optionally vanilla + salt) could actually create that distinct, malty flavor that is unique to caramel – but oh how they magically do!! It’s perfectly sweet with a touch of salt, and can be used like any other caramel – on top of ice cream, oatmeal or chia pudding; in a smoothie; slathered on toast or rice cakes; as a dip with fruit – I recommend crisp apples, on top of grilled/seared peaches, or baked for a few minutes in the toaster on a banana to get it all melty – OMG! – shall I keep going?! I recommend using it right away when it’s warm. You can also store it in the fridge and then warm it up as needed (it will solidify so needs some warming up). I also experimented with keeping mine room temperature since there’s nothing that can go rancid if not refrigerated, and though the oils separated, with some vigorous shaking the sauce came together again. I still recommend using it fresh or warming it up though when you want to use it. Enjoy this recipe and let me know in the comments below what other quick recipe ideas you’re looking for this fall! 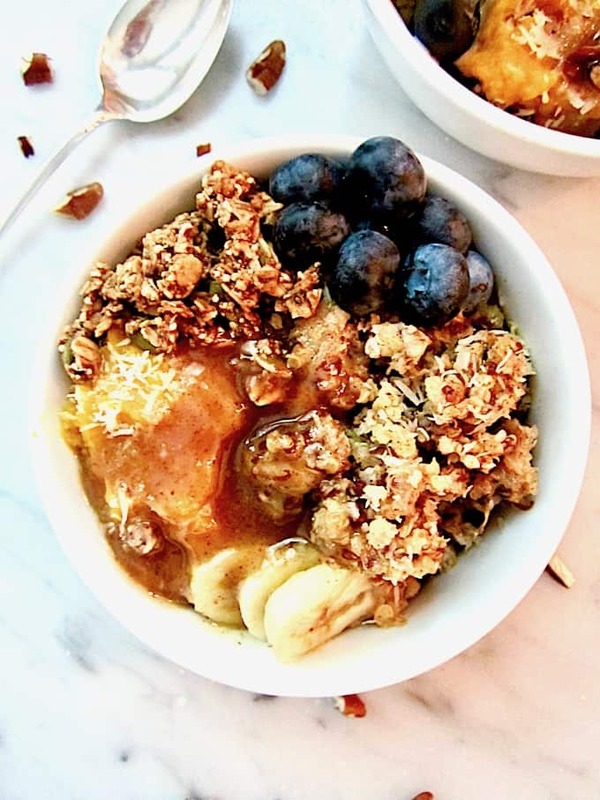 This easy vegan and gluten free breakfast is a warming, high protein meal perfect for busy schedules, topped with the most delicious 3 ingredient caramel sauce! any nuts of choice - pecans, walnuts, almonds, etc. dried fruit - chopped dates, cranberries, raisins, etc. fresh fruit - bananas, blueberries, apples, etc. Combine all ingredients in the slow cooker except the shredded coconut. Cook on high for about 2.5 hours. Fluff with a fork. I have not tested this overnight, but my best guess would be to cook on low on 4 – 6 hours. Once cooked, stir in shredded coconut and top with caramel sauce and any other toppings of choice. ALTERNATIVES: Instead of a slow cooker you can cook this in a rice cooker or on the stovetop. For stovetop, bring water and milk to a light boil then add quinoa, cover and reduce to low/medium low. About half way through cooking (8 or 9 minutes) stir in your pumpkin puree. Cover again and wait till it's cooked and quinoa is fluffy (about another 8-10 minutes or so). Turn off the heat and stir in the coconut. *To keep this recipe refined sugar free, use the Vanilla flavor. **I recommend using the caramel sauce right away when it’s warm. You can also store it in the fridge and then warm it up as needed (it will solidify so needs some warming up). I also experimented with keeping mine room temperature since there’s nothing that can go rancid if not refrigerated, and though the oils separated, with some vigorous shaking the sauce came together again. I still recommend using it fresh or warming it up though when you want to use it. This post contains affiliate links. 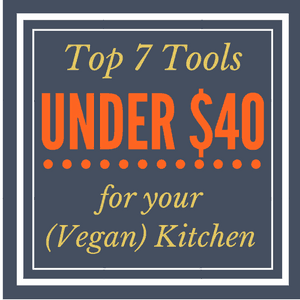 If you make a purchase on Amazon after clicking one of my links, your costs stay the same but I receive a small commission to help support Vegan Chickpea. Thank you for your support! I don't even know where to start. I love anything with quinoa and though, I've never understood the hype about pumpkin, this recipe sounds delicious! ? 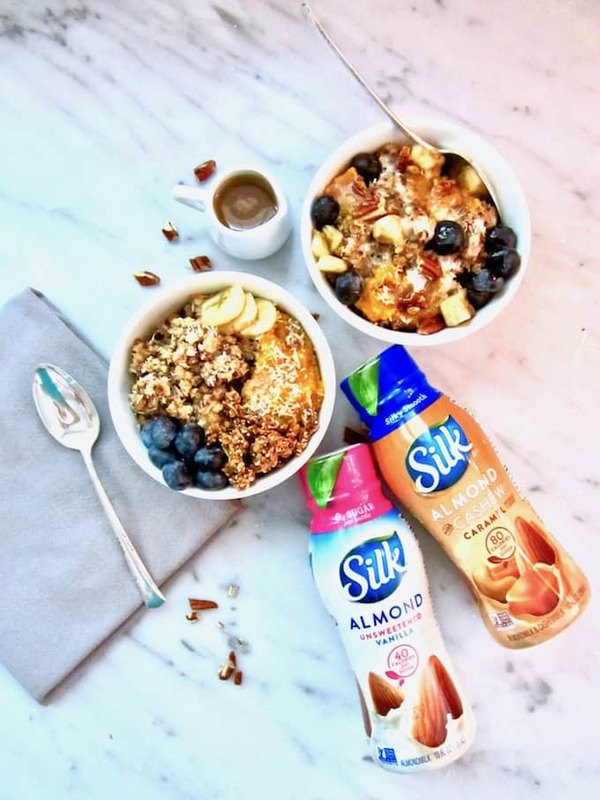 Also, silk makes the most amazing plant-based milk. I used to have it daily when I lived in the States last year! I think the hype about pumpkin is definitely an American thing - when I lived in Europe I couldn't even find canned pumpkin anywhere! ;) So great that you enjoyed Silk milks while you were here - hopefully you have some great options in Denmark! Wow!!! I am blown away, this looks incredible! I am not pumpkin spice girl, but the actually pumpkin taste is my favorite of the season! Plus anything in a slow cooker is just fine by me!! Cannot wait to try this! Thanks Dylan! I hope you enjoy it on a cozy fall morning! Who doesn't love a nice and cozy slow cooker dish? Yum! Absolutely! Sometimes they are just the best, right?! What interesting a (to me) flavour combination. What a good way to nourish your body! Thanks Brandie! It was my first time trying sweet quinoa for breakfast but I really loved it! What a delicious breakfast! 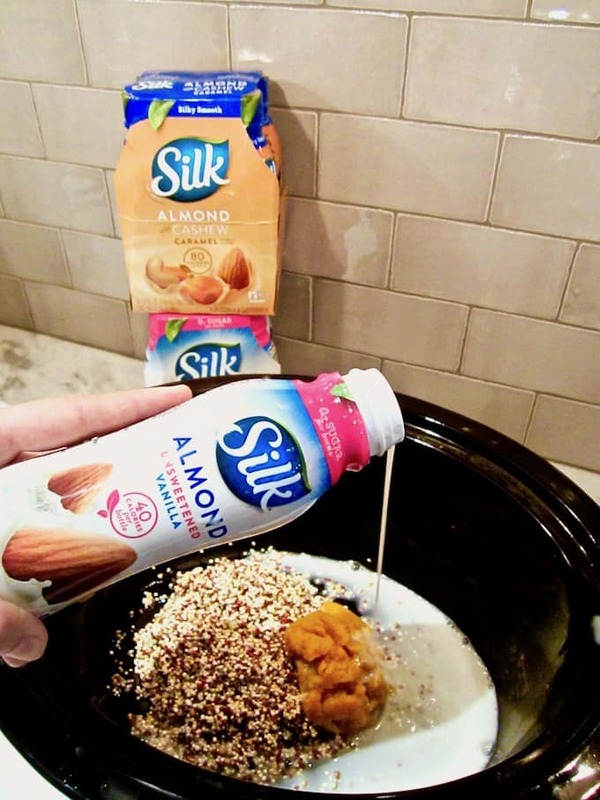 I'm allergic to almonds, but I love Silk soy milk. Yessss! I love seeing other bloggers start on fall and pumpkin foods. I always feel extra because I start posting about fall when it's still 100 degrees out - oy! This recipe looks absolutely beautiful. I don't think that I've ever had sweetly-made quinoa, but I think that I need to. LOL!! I'm totally with you Hannah on the early uptake on pumpkin! It's literally been almost 100 degrees where I am right now... but hey, I love pumpkin anytime! 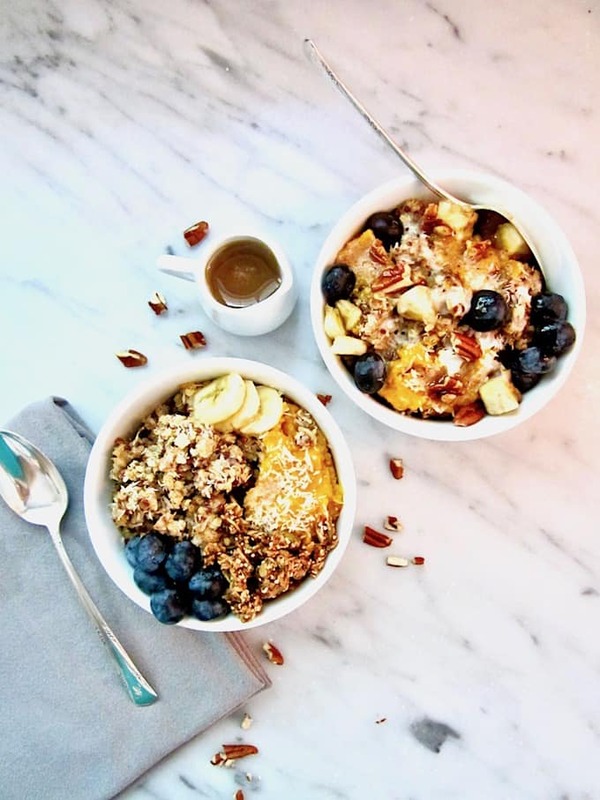 ;) YES - you've def gotta try sweet quinoa! Has anyone tried freezing this? This sounds good - I'm hoping the little threenager likes it! We have a no-nut house. What can I use instead of the almond milk and almond butter? Hi Nancy! For the almond milk you can sub any nondairy milk - so coconut, soy, flax or really even water would be fine. For the almond butter, you can try sunflower butter instead. It probably wont taste just like caramel but will still be delicious! Please report back if you give it a go. :) Enjoy! Can you please provide the nutritional info per serving as well as serving size? Hi Larisa - Thanks for your feedback. I'm working on integrating nutrition information into my site but it's not available quite yet! There are 4 servings of the quinoa mixture in this recipe. Thanks!